Mobile is the future, and this is especially the case in ASEAN member states. As a matter of fact, e-commerce logistics management platform, Parcel Perform, recently noted that emerging markets like Myanmar and Thailand are seeing rapid growth in mobile marketing. A case in example is Myanmar which recorded a tremendous increase in mobile penetration from just 10 percent in 2014 to above 80 percent or 46 million mobile users in 2017. By end-2018, according to Parcel Perform, the market is expected to reach a mobile penetration rate of over 90 percent. “Myanmar’s internet users also tend to forego the use of a desktop computer altogether, making them a mobile-only country. In Thailand, this mobile-first mentality is also occurring. Market research company, eMarketer reports that more that 90 percent of people use their smartphones to go online. The average Thai user also has 1.4 mobile phones, making Thais the most active mobile users in Southeast Asia,” the platform added. The story is no different based on statistics from ShopBack. 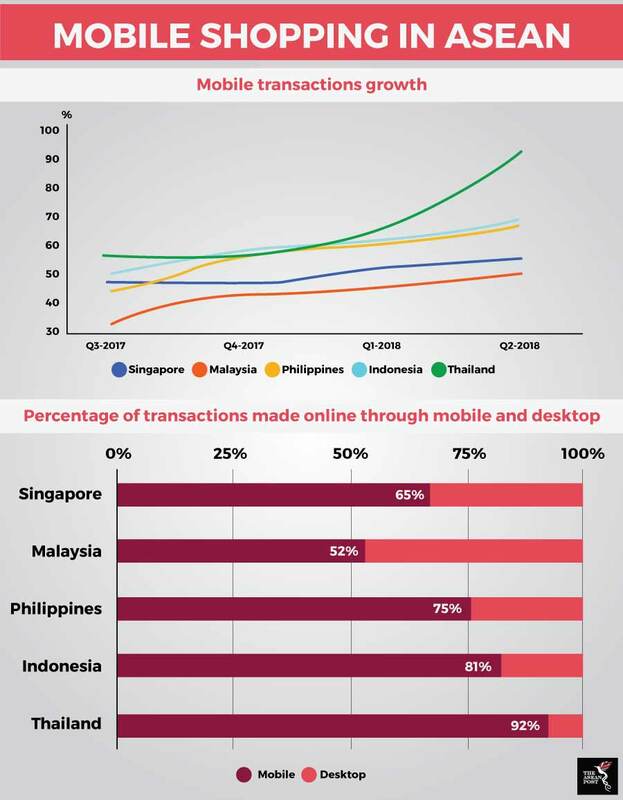 Utilising a proprietary database containing traffic and transactional data in five key economies in Southeast Asia (Singapore, Malaysia, the Philippines, Indonesia, and Thailand) ShopBack found that between July 2017 and June 2018, mobile usage was far outgrowing desktop usage. The only time desktop came ahead of mobile was when consumers made large purchases. However, out of the five economies analysed, Thailand came out tops for mobile transactions growth. Of the five countries studied, Thailand displayed the strongest preference towards making purchases using ShopBack’s mobile app. Meanwhile, Malaysia’s mobile app purchases gained 18 percent over the past four quarters, Singapore gained eight percent, the Philippines gained 16 percent, Indonesia gained 20 percent, and Thailand gained 36 percent. ShopBack estimates that by the end of the fourth quarter of 2018, the volume of app orders in Malaysia particularly will grow beyond 65 percent. The fact that mobile e-shopping in Thailand is growing the fastest becomes especially pertinent when paired by a recent study from Google and Temasek which has predicted that Thailand’s e-commerce market will grow from US$900 million in 2015 to US$11.1 billion by 2025 (at 29 percent of the compound annual growth rate or CAGR). This will make the e-commerce sector in Thailand the second largest in the region after Indonesia. “Thailand will be the hub for e-commerce and e-payments in the ASEAN Economic Community (AEC) by 2017,” predicts Kulthirath Pakawachkrilers, managing director of Joyfulness Co., an e-commerce specialist. Google and Temasek also found that while on average, consumers in Southeast Asia spend 3.6 hours per day on mobile internet, Thais lead with an average of 4.2 hours spent per day. This is followed by Indonesia at 3.9 hours per day. For context, consumers in the United States (US) spend an average of just two hours per day on mobile internet. In 2016, Thailand’s military government unveiled its newest economic initiative dubbed “Thailand 4.0”. The initiative is a master plan to get the country Industry 4.0-ready (https://theaseanpost.com/article/thailand-begins-push-automation-and-robotics) with the ultimate aim of freeing Thailand from the middle-income trap by making it a high-income nation in five years since its inception. A huge part of Industry 4.0, also known as the Fourth Industrial Revolution, hinges on mobile connectivity and the quality of that connectivity. In September, World Bank economist Richard Record hinted at the importance of connection speeds when speaking about e-commerce in Malaysia. “Without ultrafast broadband, innovations such as artificial intelligence, the Internet-of-Things, and Industry 4.0 will not be feasible,” he said. SAGE Automation, an Australian provider of industrial automation and control services, also seemed to concur with this when it noted the importance of 5G networks for Industry 4.0. “Industry 4.0 technologies begin and end with data that is captured and stored on dependable communication networks,” it said. While mobile connectivity in Thailand is certainly among the best in the region, the quality of that connectivity continues to suffer. A recent study conducted from June to September by OpenSignal found that Thailand, along with Cambodia, Malaysia, Indonesia, the Philippines, and Vietnam, have on average download speeds less than 10 megabits per second (Mbps). Thailand’s download speed averages at a mere 6.49 Mbps. In comparison, Singapore has 38.11 Mbps while Myanmar has 14.47 Mbps. The fact Thailand is doing so well when it comes to going mobile is certainly a step in the right direction as far as realising its Thailand 4.0 initiative goes. But it also places added pressure on the country to swiftly improve the quality of its mobile connectivity to prevent Thailand from falling behind in the race to embrace the Fourth Industrial Revolution.